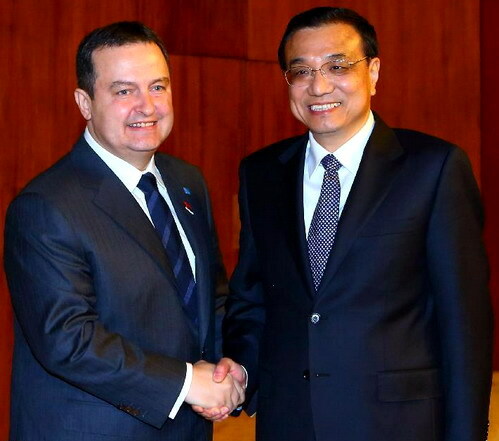 (Beijing 27 November 2013) The Summit between the Chinese Premier Li Keqiang and premiers of 16 countries of Central and Eastern Europe was held in Bucharest on 25 and 26 November 2013. Prime Minister of the Republic of Serbia Ivica Dačić participated at the Summit. In the Serbian delegation at the summit were also the Minister of Energy, Development and Environment Zorana Mihajlović and Minister of Transport Aleksandar Antić. I. Dačić stressed at the Summit that regional cooperation and cooperation with China represent the foreign policy priorities of Serbia and thanked China for having established a mechanism for cooperation with CEE countries. He emphasized that Serbia has excellent and friendly relations with China, which were raised to a qualitatively higher level after the strategic partnership was introduced between the two countries in 2009. He also recalled the joint projects whose implementation is in progress: building a section of the highway between Serbia and Montenegro, the construction of a bridge over the Danube in Belgrade (Zemun - Borča) and the second phase of the revitalization of the "Kostolac" powerplant. Serbian Prime Minister said that Serbia, as a candidate country for membership in the EU and strategic partner of China, strongly supports further strengthening of the strategic partnership between the EU and China in all segments. Premier I. Dačić , Chinese Premier Li Keqiang and Premier of Hungary V. Orban reached an agreement in Bucharest on the joint project of modernization of the railway between Belgrade and Budapest.